I had an itch for caramel apples. I’ve never tried my hands at them before, but I wanted to make them with my girls this year. I bought all the goodies, the sticks, and the apples. Now, the only thing left was for me to find an excuse to use up home school time for this delicious venture. My clever husband was the one to find one. 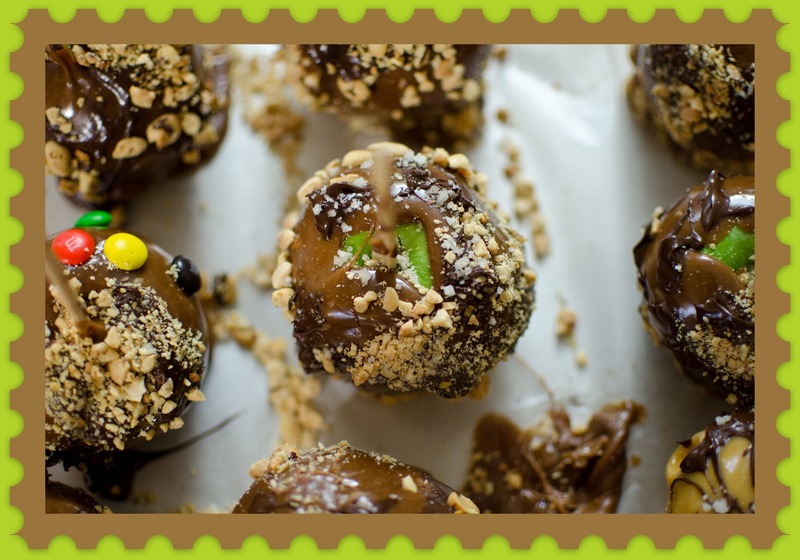 He suggested that we convert our cooking into a science experiment and test to see just how many caramels it takes to cover one apple. BRILLIANT! It wasn’t that long ago that I had introduced my kindergartener and my second grader to the 6 steps of an experiment. These are the problem, the materials, the hypothesis, the procedure, the conclusion, and the follow up. A simple posing question like, “How many caramels does it take to cover one apple?” was great for reiterating these steps. I seized the opportunity for both learning and messy sugary fun. 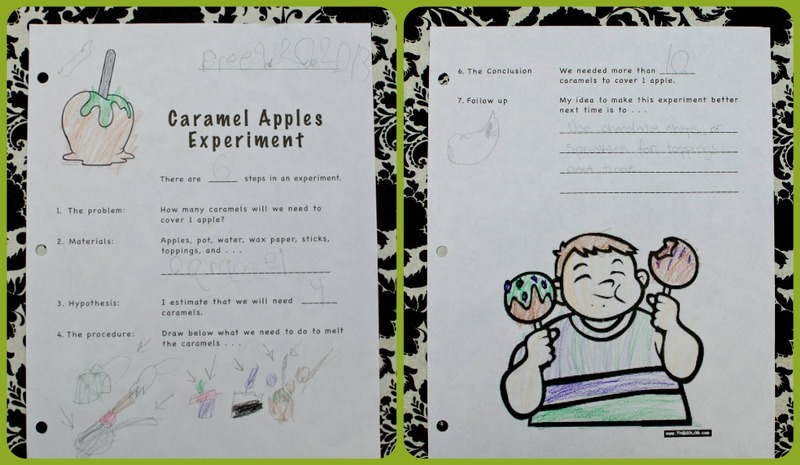 I started by reviewing the six steps in an experiment with my girls and giving them the “Caramel Apple Experiment Worksheet” that I had personally composed. The plus side to a worksheet is the extra hand writing practice it requires. Once the problem and the materials were presented, it was next up to my girls to form a hypothesis. My five year old hypothesized that it would take 4 caramels to cover one apple and my seven year old hypothesized 3. We found out very quickly that neither of these amounts were sufficient. In fact throughout our “procedure” of melting caramel over the stove, we came to the conclusion that it takes roughly 10 caramels to cover one apple. This realization hit me hard, because I knew we had 8 more apples to cover and that meant 80 little square stubborn candies needed to be unwrapped. Whew! It’s a good thing sugar can be so motivating. For our follow up both my seven year old and I agreed that spending more money on caramels next time around would be worth it, since our off brand caramels hardened too quickly for us to stick goodies to. Next year I think I may even try to make my own caramel, but there’s little chance of me finding a way to convert that into a lesson plan! For geography it’s most important to teach a child their way around maps and globes. My goal for the week was to introduce the concept of latitude and longitude. I brainstormed for a time trying to invent a way to make this otherwise tedious subject more fun. Soon I came up with an idea that combined mason jars, clothes pins, string, and candy to accomplish just that. 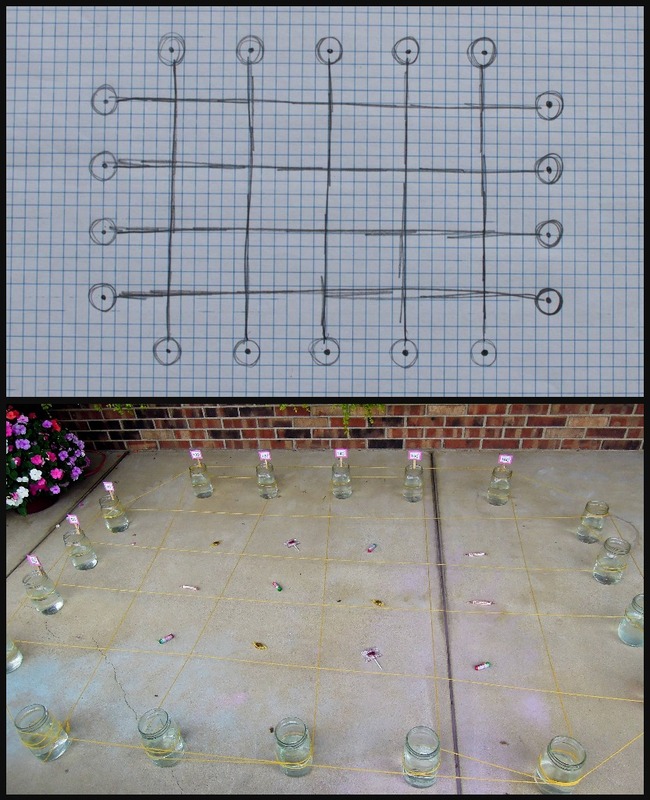 I envisioned a giant sized outdoor grid for my girls to interact with. I decided that mason jars filled with water would be my anchoring points and yarn would act as my latitude and longitude lines. Good thing I was abundant in both! Before long I realized that it would be wise to sketch everything out before I wasted time and back strength laying everything out over and again. This was most helpful and made the actual arranging of the mason jars a breeze. 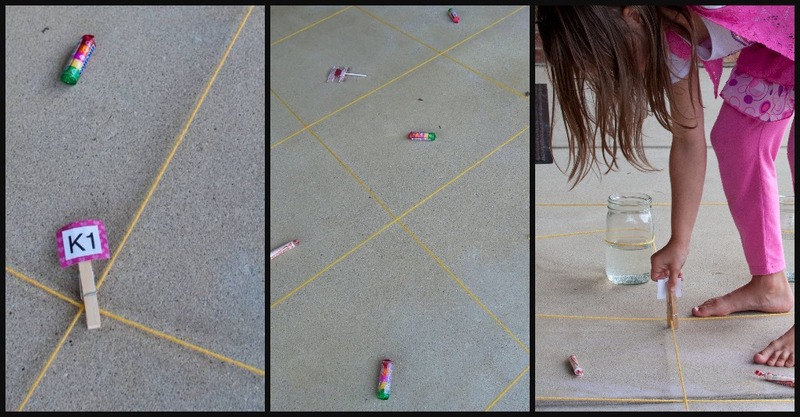 Once I had all the jars lined up in their proper places and had filled them 3/4’s of the way full with water, I weaved my string carefully and strategically around to create my latitude and longitude lines. Of course each line had to be labeled. I chose to hot glue the coordinates to simple wooden clothes pins and clipped them onto the jars. 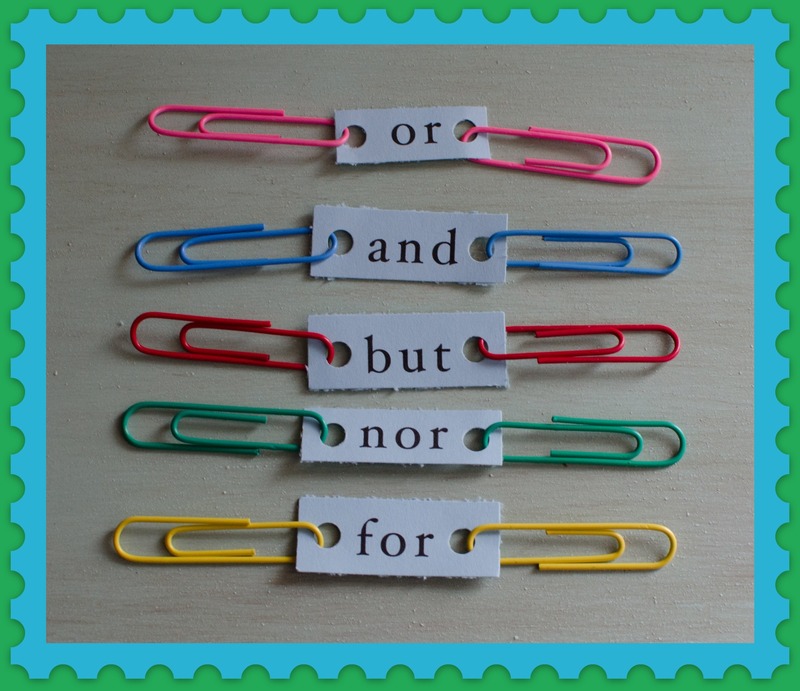 I also had to make clothes pins for my girls to use for the activity. I labeled these with their initials and numbers 1-4 to mark each of the points I would direct them to. With the grid set up and everything labeled the only step left was to pull out some incentive . . . CANDY! My idea was to give my girls four sets of latitude and longitude coordinates that would mark out a square on the giant grid. They would clip each point with their handy labeled clothespins, and whatever candy lay inside the square was theirs to gobble up in victory. What little girl isn’t motivated by candy? I will admit that the preparation for this activity was very time consuming. But isn’t the sacrifice worth it to make learning fun and hopefully memorable? To make my efforts go farther we did this activity for two nights in a row, which was just as well because clipping four points for one piece of candy turned out to take time as well. My second grader did beautifully and by the end was able to call out her own latitude and longitude coordinates for the candy she had her eye on. My kindergartener struggled a bit with the high numbers, but understood grasped the concept immediately. With a little numerical help she able to obtain just as much sugar as her sister. I’m happy to say that this activity was a success and I would recommend it to any mom or teacher!